Fitting smoke alarms can save your life!!! They are cheap to buy and easy to fit. You'll need at least one per floor of your home. They should be screwed to the ceiling fitted near the centre of the room as possible but no nearer than 30cm to a wall. Usually they come supplied with wall plugs and screws. You'll have to drill a couple of holes in the place you want them. Don't fit them in kitchens, garages or bathrooms. Test them regularly by pressing the test button which will sound the siren. If you hear them make a slowly beeping sound that signals that the battery needs replacing. 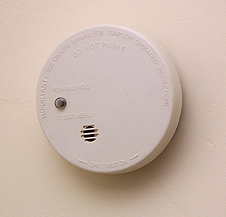 Here you'll find much more detailed information on types of alarms and where to fit them. This site also has loads of other useful information on all things related to fire safety in the home. A very useful site and well worth a visit. e.g. Do you know what's the best type of fire extinguisher to use in you home? It tells you there.